Panasonic has announced its latest rugged notebook which is known as Toughbook 31. The rugged notebook has been designed to meet the military standard 810G for protection from six-foot drops, dust, shock, vibration, salt, fog and humidity as well as temperature extremes. The casing of the notebook has been fully sealed with magnesium alloy for improving water resistance and scratching. The 13.1-inch rugged notebook is powered by Core i5 or Core i3 processors along with available discrete graphics and packs a punch to deliver desktop-class performance and improved video/3D graphics. Operating system – Windows 7 Professional (with XP downgrade option). CPU – Intel Core i5-540M vPro 2.53GHz processor with Turbo Boost up to 3.07GHz, Intel Core i5-520M vPro 2.40GHz processor with Turbo Boost up to 2.93GHz and Intel Core i3-350M 2.26GHz processor. Storage – Shock-mounted flex-connect hard drive with quick-release: 250GB (540M CPU) or 160GB (520M and 350M CPU) , and optional 256GB solid state drive (SSD). Memory – 2GB SDRAM (DDR3-1066MHz) standard with expandable to 8GB. Display – 13.1-inch XGA touchscreen with Panasonic CircuLumin technology: 2-1100 nit, Circular polarizer (i5 CPU), AG and AR. Audio – Intel high-definition audio compliant, integrated front-facing speaker, convenient keyboard volume and mute controls. Expansion Slot – PC Card Type II x 1, SD Card (SDHC) and ExpressCard/54 x 1. Interface – Port replicator, HDMI, VGA, Serial port, 4 USB 2.0, 10/100/1000 Ethernet and etc. Wireless – WiFi and Bluetooth v2.1 enabled. 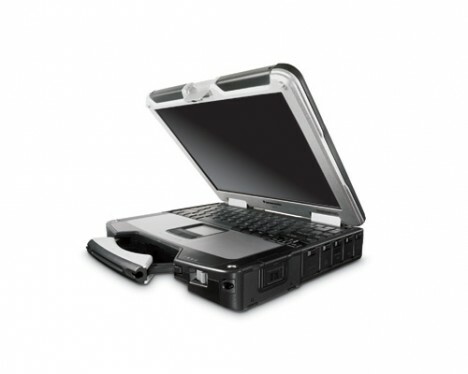 The Toughbook 31 is now available with the price start from $3,800.